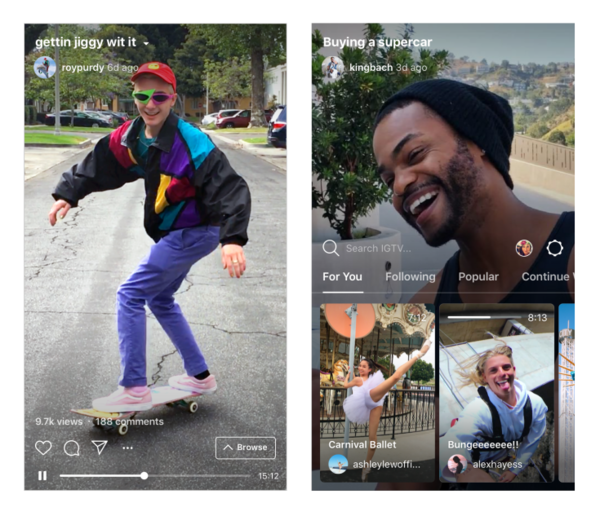 Instagram TV draws a lot of inspiration from video sharing platform YouTube and allows anyone with an account to upload videos for Instagram’s new IGTV section. These videos will display them full-screen and vertically, the way people naturally hold their phones. The video section will feature content from people users already follow on their account. Instagram has also stated that IGTV is also a separate standalone mobile application for iOS and Android, where videos will start playing automatically when the app opens. Unlike on Instagram, the videos in IGTV won’t be limited to just one minute -- they can be up to an hour long. People will also be able to comment on the videos and send them to friends. These long-form content medium will allow celebrities, brands and influencers even more freedom to create content on the platform and will definitely increase time within the app as content becomes longer and more frequent. Personally, I see this as a way to become a preferred medium for long-form video content on mobile and create more visual real estate only later to monetise this with multiple ad slots similar to YouTube. Why the launch of Instagram TV? Instagram has stated it’s has no immediate plans for paying for any content on the app, nor will it start with any advertising. But eventually, it plans to make sure people making popular videos have a way to make money from their efforts, with a revenue share model. Instagram’s efforts in soliciting user-generated original video come after its parent company has worked for months to build up Facebook Watch, a TV tab within the social networking app. Facebook has paid studios and news partners to create content that lives on Facebook, ideally creating buzz and spurring people to share with their friends. The concept competes with Google’s YouTube. Facebook is paying for rights to shows now, but the company aims for the content to eventually be popular enough to be supported solely by advertising revenue. Video-makers on IGTV will be able to choose to also post their content on Facebook Watch, which could help Facebook’s efforts in that section. Facebook has had a tough time launching its video platform and looks to leverage Instagram as an easier adoption platform with a younger more active audience. While Facebook is mostly used for people to connect with friends and family, Instagram is a place where users have been more comfortable following people they don’t know, exploring new content based on the tagging system and recommendations and helping build an entire ecosystem of influencers who make money from their Instagram fame. Instagram has been in a scaling phase since the acquisition by Facebook and has focused primarily on attracting, building and maintaining a large enough audience to sustain future monetization options which are slowly being introduced. First, they started with sponsored posts, then they launched direct purchase posts, recently they've introduced credit card in-App purchases and now they looking to increase advertising real-estate. Instagram is slowly pivoting from a free photosharing app to a visual-based ad platform that will blur the lines between native and paid content for the majority of its users an, in turn, generate returns for advertisers in order to become a preferred advertising medium.